Tell your students that they will be focusing on the main idea and details of stories today. Ask your students if they know what those words mean. Beginning: Preview or review the definitions for new vocabulary words in both English and the students' home language (L1). Intermediate: Have students turn and talk to a partner to share their ideas. Explain to your students that a main idea is what a story or article is mostly about. Explain to your students that details are facts and descriptions that will help them understand the main idea. 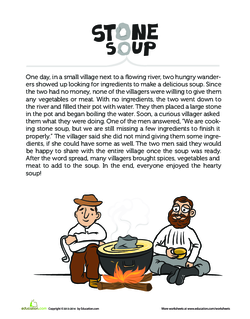 Read the Stone Soup worksheet out loud to your class. Ask your students what they think the main idea is. Write it on the board. Explain to your students that the main idea is not always stated in the text and that they have to come up with it after reading the story. Ask your students to write three details that support the main idea. 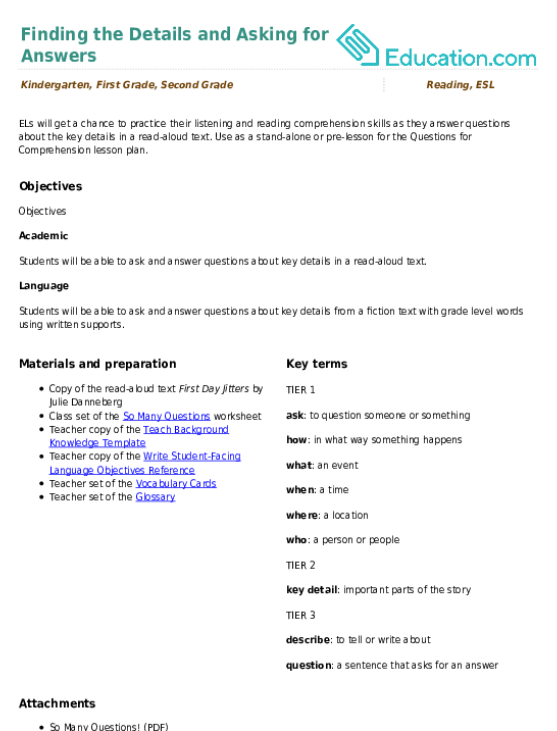 Project the text for students to reference as you read it aloud. Underline the supporting details on the text for students to visualize as you find them. Intermediate: Provide further instruction on the differences between main idea and supporting details using an additional text and/or modeling one time before reading Stone Soup aloud. 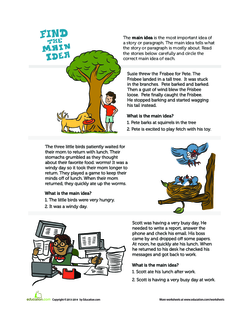 Ask your students to work on the Find the Main Idea worksheet with a partner. Go over the worksheet with your students. 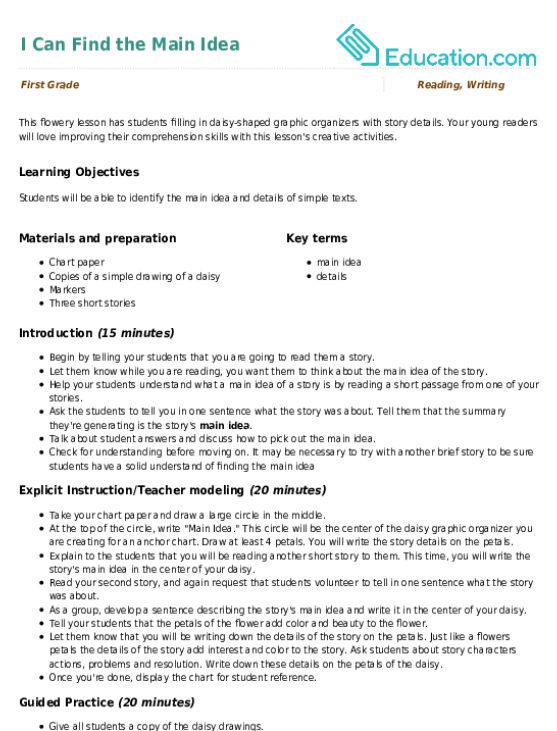 Beginning: Display the Find the Main Idea worksheet to the class and go over it together as a group. Intermediate: Provide students with pre-chosen partners who can support their lingustic understanding. 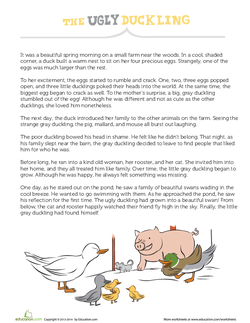 Instruct your students to read the The Ugly Duckling worksheet. Ask your students to write down the main idea of the story. Ask your students to write three details that support the main idea they wrote. Remind your students to write in full, complete sentences. 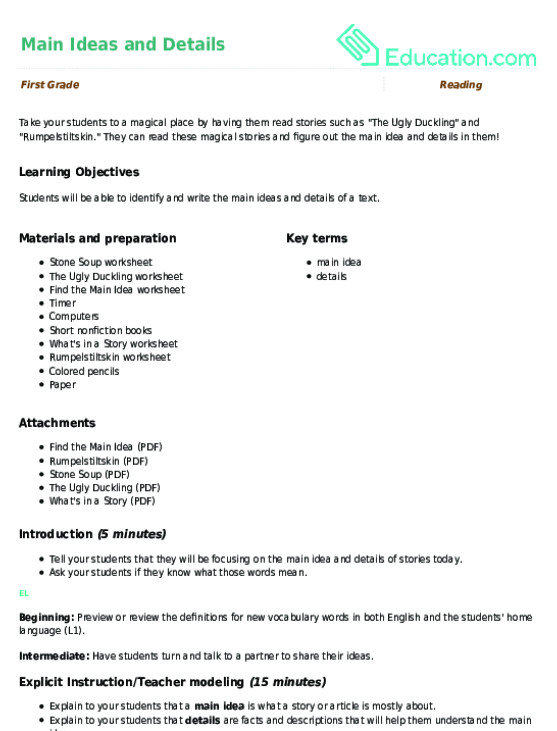 Go over the main ideas and details that your students wrote as a class. Explain why a certain main idea or detail is correct or incorrect. Beginning: Read aloud the Ugly Duckling story in a small group and work with students to find the main idea and supporting details by underlining them on the worksheet. Intermediate: Provide pre-written sentence starters or sentence frames for students to utilize when completing their worksheet. Enrichment: Instruct your students to pick a short nonfiction book from the class library. Ask your students to read it and identify the main idea. Ask your students to also write three details that support the main idea. 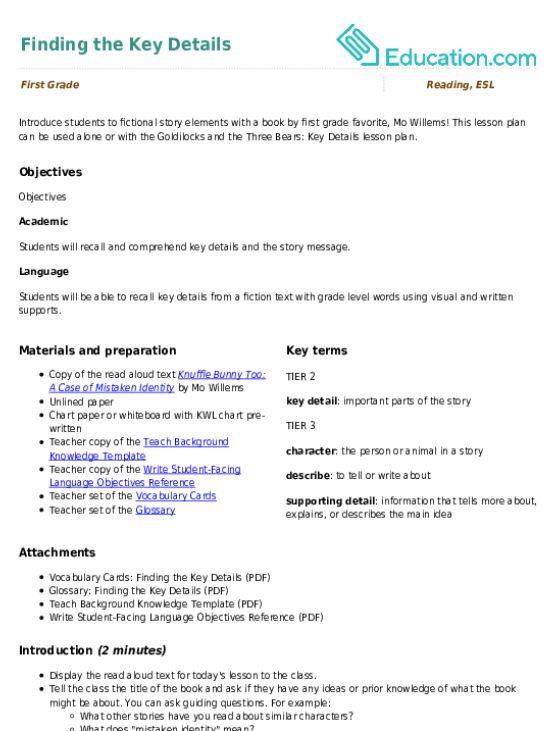 Have students get on the computer and find three additional details that support the main idea. Support: Pick a short nonfiction book, and ask your students what they think the book will be about. This will activate their prior knowledge. Write down what your students say on the board. Read the book out loud to your students. Ask your students what the book was mainly about. Instruct students to write the main idea, and have each student in the support group come up with a detail that supports the main idea. Discuss the details that each student wrote as a group and why it is a detail. Direct students to complete the What's in a Story worksheet. Assess student understanding by paying attention to student questions and comments throughout the lesson. Ask students to share their own definitions of main idea and supporting details. Collect student work and assess if they were able to identify the main idea and supporting details. Have students share their worksheets with a partner to compare their thinking. As students are discussing their work, assess if they are able to accurately identify main idea and supporting details. 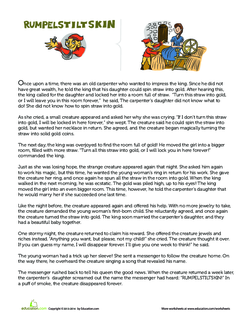 Read the Rumpelstiltskin worksheet out loud to your students. Ask your students what the main idea and details are. Pass out loose paper to each student. Display the main idea and details on the board. Instruct students to draw and color the main idea and details. Beginning: Invite students to turn and talk to share the main idea and supporting details with a peer. Intermediate: Provide sentence starters for students to use when sharing out with the class. 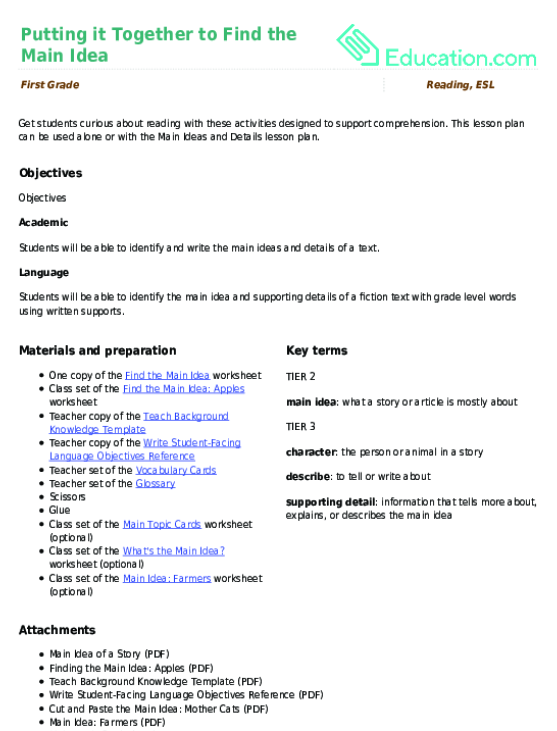 This lesson plan can be used alone or with the Main Ideas and Details lesson plan. 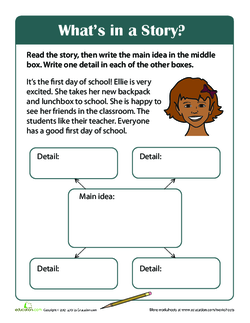 This flowery lesson has students filling in daisy-shaped graphic organizers with story details.